Although there’s several items in the dimensions, there’s two free items available on the normal island too. The Funny-Face Glasses can be found next to the chairs and the starfish at the Beach, in a cardboard box. The Blue Propeller Hat is a bit more tricky. You’ll need to keep throwing snowballs at the painting at the Dock, until eventually, the correct painting will form. You’ll probably need to do this a couple of times though. Eventually, you’ll be able to collect the Blue Propeller Hat too. The Box Dimension is the main area of action for this event! You can access it from the Snow Forts or an igloo, though there’s lots of fake ones scattered throughout the island too. From there, you can explore several other dimensions. Each one is marked with its own symbol. This dimension has the cactus symbol and is where you can find the Box Store. From there, you can purchase several furniture items including the portal to take you to the Box Dimension once the party is over. It also contains a hidden item! If you click the “O” in “Store” at the top, you’ll be able to receive the Box Costume. This dimension has the symbol of the Jester Hat, and in it, you can find the King Jester Hat! It’s located on the far right of the room beneath the joke rating board. A bit more tricky, but this dimension (with the icon of a barrel) contains the Box Hat, but you’ll need to get across and stand on the platform next to the item. Entering each barrel will take you to another location, but unfortunately, your spawn location seems to be random. Once you stand on the platform, the cage will rise. You’ll also receive the Path Finder stamp along with the Party Puzzle stamp for completing this. The last dimension with something significant in it, and one of my favourites! It has the symbol of an ice cream. If you throw a snowball in this dimension, you’ll receive the Food Fight stamp. Though those are the dimensions with rewards available, there’s plenty more of the island to explore, including the other dimensions! Something really cool is the Recycling Plant, it’s been turned into a loading screen. There are lots of silly rooms, from those turned upside down like the Forest to those with inverted colours, such as the Gift Shop. 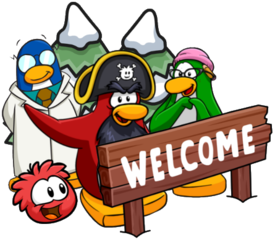 Rookie will also be incredibly likely to visit for this party, as he’s been hinted to across the game! 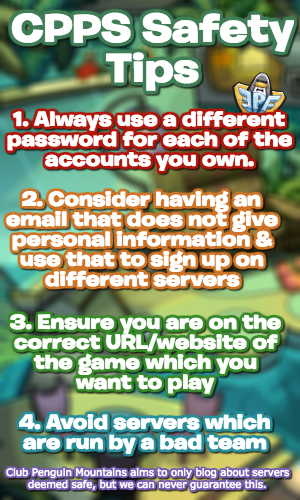 I apologise for the slightly obscure post with this one, but thank you for reading, I hope that this guide helped, waddle on! Where are the box shoes? Without them, the rest of the outfit makes no sense! They weren’t present for some reason! What about the stair dimension? There is something that is clickable. Could you please find out more? There is a specific sequence for going through the barrels. If anyone needs help, I can try to explain. If you don’t already have it, I think you get the Party Puzzle stamp once you reach the square and lift the cage to receive your item. As for the Blue Propeller Hat, as Torres said, you have to throw lots of paint. You will know when you are about to receive the gift when the picture you paint uncovers a gold treasure chest. If you click the “O” in “Store” at the top in Desert Dimension, you’ll be able to receive the Box Costume. hey, I managed to get to the box hat, but I didn’t get the path stamps. what do you think I did wrong or could’ve done differently? If you click the spoon in the Candy Dimension, you get some sort of brown box/wafer. Do you know if it does anything if you click on it? Nothing I’m aware of, sorry! Hey! I noticed that too. The old Club Penguin had a scavenger hunt in the box dimension. That and a tile in the stair dimension unlocked items for the hunt. They don’t do anything anymore. Stu has confirmed that, along with the random tile in the stair dimension, the box things are glitches that the team can’t remove- left over from a previous scavenger hunt. For the Soda Barrel dimension, the easiest way to get past is by going back through whichever barrel you spawn from, repeating until you get to the final one. Not sure if I’ve explained myself properly but ya. Hmm…I did try that but it didn’t work for me, maybe I did something wrong? That room has already released though? What about the Stair dimension? How do you get to the wood plank, and it there an item for getting to it? Sorry for not responding to this sooner! I’m pretty sure there wasn’t any additional item outside the ones mentioned in this guide. i have never been able to see the rookie. does he only come at specific times of the day? Nope, he’s visited at several different times to be fair to all timezones!